Get Superior Tool Life with TiCN Coating! Optimize Tool Performance with TiCN Coating! Want two to four times the tool life over TiN? Check out titanium carbo-nitride (TiCN) PVD coating. Adding carbon to a TiN film increases the hardness nearly 80 percent, resulting in additional tool life. TiCN is an excellent all-purpose coating, but does particularly well in punching, injection molding and cutting tool applications. 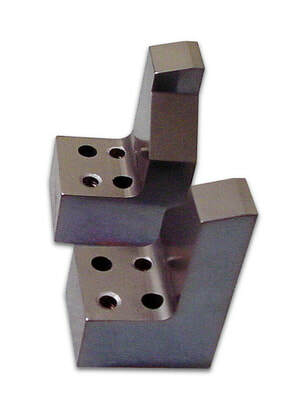 TiCN is easily stripped from common tool steels. This makes it ideal for those applications where you want maximum tool life, but also the capability to remove the coating when it wears through and reapply it. TiCN can come in a range of colors, depending on the percentages of nitrogen and carbon in the film. Films that are high in nitrogen will be brownish, while those with a higher carbon percentage will be metallic or grey in color (TiC on the surface). Provides 2 – 4 x the tool life vs. TiN-coated tools. Biocompatible, used on many medical instruments and implantable devices. TiCN and TiN can be easily removed from tool steels. Our astute customers often remove tools from service before the substrate is worn, have the coating stripped and reapplied, thereby avoiding the cost of manufacturing new tools. You too could make your tools last forever by using stripping and recoating to keep expensive tooling up and running. Get 2 – 4x the Tool Life (of TiN) With TiCN Coatings!